I was surveying my stacks of manga and decided that I needed to make more of an effort to get into the Halloween spirit. I figured that Black Torch was an ideal candidate since it features supernatural beings and a black cat, who is also a supernatural being. Spooky! Jiro is the plucky protagonist of this manga, who has some unique abilities. He has the ability to talk to animals and is descended from a long line of ninjas. He also has absolutely no tolerance for animal cruelty, as the opening scene in the manga shows him driving of a gang that was bugging a stray cat and raven. Jiro’s Grandfather seems to mainly enjoy yelling at his grandson about ninja traditions. Jiro finds out about a cat in distress and goes to rescue it. He finds Rago, a demon (or mononoke) trapped in the form of a black cat. Jiro learns that Rago was caught up in a demonic struggle, and doesn’t remember all the details of his past. Jiro is determined to help Rago, even though the demon attempts to leave Jiro, he is relentless in his desire to help. This is one of the more endearing aspects of Black Torch, even though Jiro ends up getting trapped in a deadly mononoke battle. Rago and Jiro end up being fused together, as Rago goes to help his reckless ninja friend. There are elements that are somewhat predictable in most shonen manga, like a supernatural protection agency and the hints that Rago and Jiro will soon join a team fighting evil. The art in Black Torch has a slightly scratchy quality that I enjoyed. Rago’s surprised cat faces were hilarious, and when his mystical powers manifest in the form of swirling black tendrils surrounding his cat form, the effect is suitably dramatic and mystical. The action scenes are dynamic. 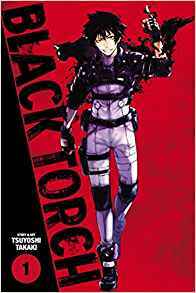 While Black Torch doesn’t stray far from the typical shonen manga formula, Jiro’s devotion to animals, the odd couple relationship between him and Rago, and Rago’s hilarious cat expressions go pretty far in making it an enjoyable supernatural action manga. I had a good time getting caught up on this series in order to enjoy the special edition concluding volume. After having to deal with the grand conclusion of the saga concerning Tomoe and Akura-ou, including visiting the land of the dead, tracking down Akura-oh’s immortal body, and dealing with Nanami’s decline after having her life force taken from her, the final volume gives all the characters in Kamisama Kiss some much needed breathing room, as Nanami and Tomoe prepare to enter the world of human adulthood together. Along the way Nanami helps out the Kotaro and Himemiko one last time, and it is nice to have this circular moment of returning to some of Nanami’s first friends after she became attached to the Ayakashi world. 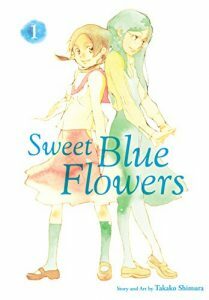 Nanami and Tomoe’s wedding is a little bittersweet, because when they both become human, they’ll become cut off from the world where all their friends live. This is especially hard on Mizuki, who is worried about being left alone. Nanami and Tomoe decide to marry on the last possible day before becoming human, so everyone can be invited to the wedding. 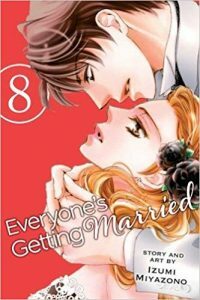 I do enjoy final volumes that allow the reader to say goodbye to an extended cast of characters, and this volume pulls off the reunion and celebration in a lively fashion, with detailed wedding costumes and panels that pause to show all the wedding guests. Someone as capable and arrogant as Tomoe isn’t going to have too much difficulty fitting into the human world, and the final chapter shows just how capable the newly human couple is at adapting to their new life. The limited edition featured a slim hardcover book with the first few pages devoted to small reproductions of the color pages in the manga volumes. This was done in a collage, year-book style layout which was nice, but it also made me really long for an oversized volume of Julietta Suzuki illustrations because some of the detail was lost. The bulk of the volume is an extra bonus story that shows more of Nanami and Tomoe’s life after becoming human, with bonus pencil sketches of the final chapter of the manga. It was nice to get a window into Suzuki’s artistic process, I only wish the special bonus book had been two times the size and twice as long, but I shouldn’t be greedy! 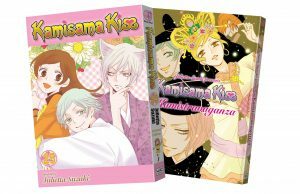 Kamisama Kiss was such a special series, I’m glad the final volume got a little extra bonus for the long-time fans who have enjoyed the series for so long. I have great difficulty reading Haikyu!! because my kids keep stealing my volumes and rereading them before I have a chance to get to them, but I recently managed to find volumes 3 and 4 and stash them away so I finally got a chance get caught up. I’m very much enjoying the pacing of the story in Haikyu!! and also the accelerated release schedule that Viz has been setting for these volumes, so I don’t have to wait too long for the next one. The first couple volumes firmly established the new rookies on the volleyball team, Kageyama the perfectionist and Hinata the enthusiastic but short volleyball savant, but two rookies can’t make up a whole team. There are still some essential players missing, and these two volumes did a good job at filling in the gaps of the Karasuno High Volleyball team. The third volume introduces Karusuno’s libero, a player who specializes in defence. Yu Nishinoya is even shorter than Hinata, and he’s fiercely dedicated to his specialist position. When he shows up to practice, he’s disappointed that Karasuno’s ace Asahi isn’t participating. He refuses to play without Asahi, but is won over by Hinata’s enthusiasm and desire to learn. The spector of the missing Asahi hovers over practice, and when the reader is introduced to him, he looks at first like a mild giant, his fighting spirit knocked out of him by a horrible volleyball loss the last time he played. Another missing piece is a coach, Keishin Ukai, the grandson of the legendary coach who was responsible for Karasuno’s winning era. Ukai promptly sets up a new challenge for the high school kids – they have to play the local municipal team of adults. Along the way, Yu actually mangest to get Asahi involved in the game again. Bolstered by additional players and a coach, the team is starting to pull together. The fourth volume shows the team take on a new challenge – a practice game with their traditional rivals, Nekoma High. 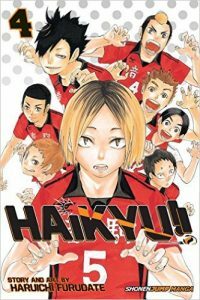 One of the things I enjoyed most about this volume was seeing the personalities and playing habits of Karasuno pitted against another high school team. Karasuno still has a long way to go, but they have flashes of brilliance here and there which hint at success in future volumes. Sometimes sheer determination and repetition forces Hinata to take his game to the next level. The trust developing between all the teammates is also key to their improved performance. Haikyu!! is just delightful to read, and while I might be inadvertently learning more about volleyball strategy than I ever expected, seeing all the subplots develop as each member of the team has individual struggles to reach their full potential is what makes this series so entertaining. Widening the focus of the story to include other team members like Asahi and Nishinoya keeps everything fresh, as the rookies have to adjust to the changing team dynamics. I’m enjoying the way this story seems to is moving along at a fairly fast clip, but still seems to have plenty of time for character development and world building. 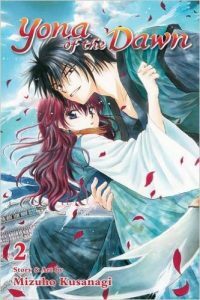 In the last volume Princess Yona’s world was utterly shattered and she has to go on the run with her trusty protector Hak. He takes her to the home village of the wind tribe in order to seek refuge for a short time. I was happy to see that in this volume, Yona’s resolute spirit is highlighted, since she was mostly silly, sassy, and incredibly depressed in the first volume. As they reach the Wind Tribe, there’s a little bit of comic relief as Hak meets up with some fellow warriors. Yona is exhausted, but living among the Wind Tribe helps her gain back some resiliency as she’s surrounded by a warm family. Hak continues to tease Yona somewhat relentlessly in such a way that I’m assuming that he’s just trying to cover up for his feelings for her. Yona has an opportunity to stay and live a quiet live with the Wind Tribe, but when it becomes clear that Su-Won isn’t going to stop trying to track her down. Yona is still a valuable political pawn. What I most enjoyed about this volume is that I was able to see some flashes of the heroine I’m sure Yona is going to become. When Hak tries to leave her behind, she cuts through his joking demeanor and demands his fealty, and they strike out on their own again. Su Won’s soldiers are determined to capture Yona, and she stands up to the enemy, demonstrating that she isn’t the broken princess they were assuming they would find. I hadn’t realized that this series was so short, followed by a rebooted sequel series. So this concluding volume isn’t so much of an ending as it is wrapping up one stage of the series and signaling a new one. Still, with Motomi behind things, QQ Sweeper still manages to be a pretty satisfying non-concluding three volume series, and I hope Queen’s Quality also gets licensed. As the volume opens, Kyutaro knows that Fumi is his long-lost childhood friend, but her peculiar amnesia prevents her from remembering any elements of her previous life. He’s content to be near her, even if she doesn’t regain her memories. While there is a little bit of school drama, most of the conflict in this volume comes from Fumi being signaled out by a new enemy, Ataru, pretending to be a boy with fortunetelling skills. Ataru shows up for group karaoke dates but then manipulates everyone around him by intoning dark prophecies. One of Fumi’s friends is particularly susceptible to this type of plotting, and Fumi soon finds herself gossiped about as being cursed yet again. Fortunately some of her closest friends don’t fall into this trap, and QQ Sweeper shows that there’s plenty of possibility for redemption in humanity after all. All along in Fumi’s efforts to become a sweeper and clean up bad supernatural messes, there have been hints of a larger destiny for her. As Fumi and Kyutaro confront Ataru, he references Fumi’s potential to become a Queen, and she exhibits a greater degree of confidence and control in bring back her friend’s lost soul. Motomi series always have an endearing quirkiness about them, that when combined with the themes of friendship and found family result in manga with a unique feel. QQ Sweeper‘s juxtaposition of random domestic cleaning with violent supernatural confrontation with some humor here and there made me wish that this wasn’t the last volume. I hope to see these characters again in Queen’s Quality if Viz decides to bring out that series too! I enjoy Shouoto’s other series, Kiss of the Rose Princess, so I was interested in trying out The Demon Prince of Momochi House. When I read the description and looked at the front cover, I was also curious to see how similar it might be to another Shojo Beat series featuring yokai, Kamisama Kiss. Himari Momochi is a plucky orphan who inherits a house that has been in her family for years. She decides to journey to Momochi House and claim her inheritance, despite some dire warnings along the way that the house she’s traveling to is haunted. When she arrives at the house, the inside is trashed and shadowy figures keep brushing past her as she explores the interior. One of the shadowy figures ends up being a naked young man named Aoi, who is quickly admonished to put clothes on by a couple of other men. They accuse Himari of being a burglar, and she quickly produces the legal document that proclaims she’s the owner of the house. Himari is determined to stay, and the horrible cleaning jobs that await her and the mysterious implosion of her smartphone, and presence of male squatters do nothing to change her attachment to her new home. Mysterious animal yokai appear, and Himari is introduced to the supernatural elements that occupy her house. Aoi is serving as the guardian spirit, and the other young men are his helper spirits Yukari and Ise. When Aoi switches from his human to Omamoiri form, he admonishes Himari not to look at him in his beguiling fox spirit guise. Himari thinks the relationship between Aoi and his helpers is very much like a family, which makes her wistful. She’s also pragmatic despite the new element of the supernatural in her life, deciding that she needs to charger her three freeloaders rent and thinking about investigating enrolling in a local school. Aoi and Himari are clearly attracted to each other, and Aoi seems to be operating under an imperative that he protect her at all costs from the haunted elements that still exist in her ancestral home. Demon Prince of Momochi House is a much less silly series than Kiss of the Rose Princess. I think the art is stronger and a bit more distinctive than Rose Princess too. Sometimes drawing spirits brings out the best in a manga-ka! Some aspects of this series did remind me of Kamisama Kiss, but I also feel as though Kamisama Kiss is such a standout series in terms of quality that other manga are going to suffer in comparison automatically. I wish there had been a bit more character development, because so far the characters seem more like types than fully realized individuals. I found myself liking Kiss of the Rose Princess more as the series progressed, and I’m expecting that to happen with The Demon Prince of Momochi House too. 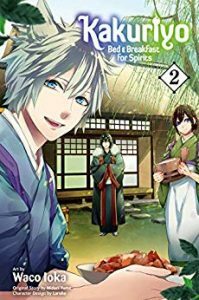 It could be that I’m just a sucker for series featuring handsome spirits, but I enjoyed this first volume much more than the first volume of Kiss of the Rose Princess too. I’m hoping for more character development in the next volume.